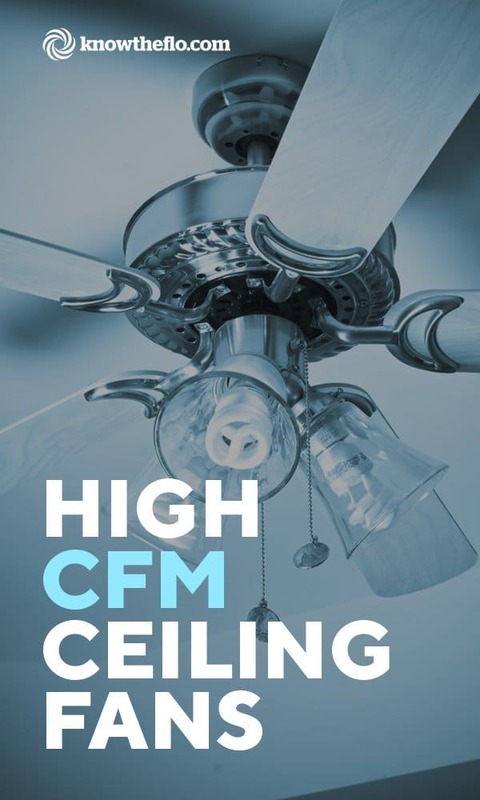 If you are on the lookout for a high CFM ceiling fan be sure to read on as we cover your options, but lets first break things down so you know where to start. There are a couple of things you need to know when it comes to ceiling fans and CFM which are worth considering. The first is that having a high CFM ceiling fan may mean you may not have an energy efficient fan. It is common for a fan to be measured in terms of ‘airflow efficiency’ which effectively measures the output per energy. It is measured by taking the CFM and dividing by the electricity us to determine ‘airflow efficiency’. The crux of the article is that when searching for a powerful ceiling fan choose a number of high CFM ceiling fans and then check their wattage to find which fan is going to be the most energy efficient. Some ceiling fans will also have an Energy Star rating which also means that it is highly efficient. The other thing to consider when looking for a high CFM ceiling fan is, well, how high do you need? There are many guides out there to what size ceiling fan you should look at for your room. If power alone is what you are looking for then an industrial ceiling fan might be what you are after. Having said that, we will focus on high speed ceiling fans with high CFM for the home, having already covered commercial ceiling fans. Below are a number of high CFM ceiling fans for the home. • Most ceiling fans we found around 50-60 inches on average have around 4-6k CFM so there are a number of fans not in this list with 6000 CFM or similar. • We tried to keep the list to 60 inches and below. If you are looking for a larger fan then you might want to look at industrial ceiling fans.